Since King.com released the mobile version of popular Facebook puzzler Candy Crush Saga, I've been praising the developer's flawless implementation on iOS and Android. While fiddling about with my iPhone's time settings over the weekend I discovered that's not entirely the case—the mobile versions will let players cheat. It's not quite cheating in a traditional sense. Players don't gain super powers or the ability to bypass particularly difficult levels—they just don't have to wait for their lives to recharge before trying again. Candy Crush Saga gives players five lives at a time to journey down the path to candy-matching adventure. Every time a level ends without its objective fulfilled, a life is lost. Lives are regained at a rate of one every 30 minutes, though players can receive extra lives as gifts from their friends or through in-app purchase. Or they can set the calendar on their Android of iOS device up a day. The mobile version of Candy Crush Saga syncs with the Facebook version, but it only syncs player progress and gifts sent from friends. Lives are separate between the social and mobile platforms—use up all of your lives on Facebook and your mobile version still has the full life complement available. On iOS and Android the life timer works off of a device's internal clock, so setting the time to manually and pushing it forward convinces the game that you've travelled forward in time. Use up all five lives, advance a day, get five more lives. The only complication, other than not having an excuse to stop playing, is that when you set your clock back to the normal date your life timer suddenly has several thousand hours on it. Remove the app, re-install it, and you're good to go. 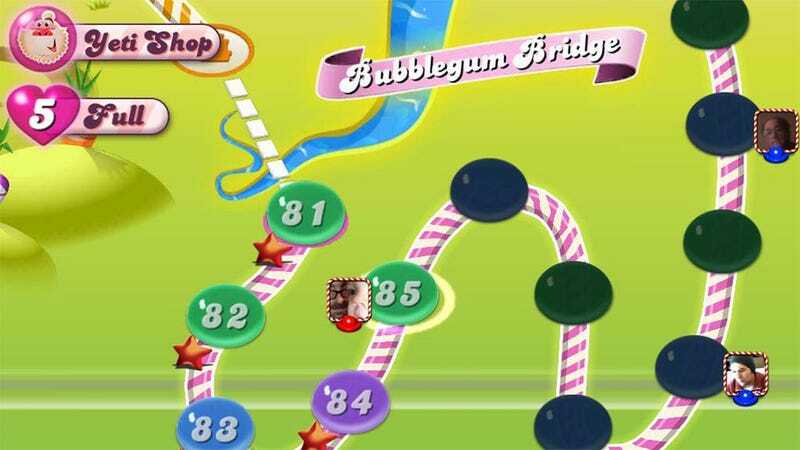 Candy Crush Saga is a game that makes its money trafficking in frustration. Players throwing themselves against a particularly difficult level with buy extra lives and expensive power-ups in order to push on through to the next challenge. Taking the life mechanic out of equation cuts the frustration factor significantly, leaving the player free to retry a level as often as they'd like. That's not necessarily a good thing, mind you. To some that frustration is an integral part of the experience—without it, Candy Crush Saga is just an endless series of often unfair puzzles. That, and the life mechanic is a good means to keep players from sitting in the bathroom for an hour, failing the same level over and over again.